Magic Origins is just around the corner. It's truly unlike any core set you've seen before: two new mechanics, more new cards, and five Planeswalker origin stories to explore. Magic Origins takes a look at the beginnings of five of our most iconic Planeswalkers: Gideon, Jace, Liliana, Chandra, and Nissa. You'll see where they come from, how their sparks ignited, and what happened in the aftermath. I know we can't wait for you to experience the whole set, but let's start by taking a look at the mechanics–new and old–that await you. Why not kick it off with the highlight? The five Planeswalkers I mentioned before show up in Magic Origins as five double-faced cards–the front face shows the characters as legendary creatures and the back face shows them as Planeswalkers. These are the cards that show their sparks igniting. If you've never seen double-faced cards before, I'll give you a moment to take it all in. That's right. Two faces. No card back. Weird, right? Each face has its own set of characteristics–name, type, subtype, abilities, mana cost (or no mana cost for the back face), and so on. When a double-faced card isn't on the battlefield, you consider only the characteristics of the front face. So if you cast a spell that lets you search your library for a creature card, you can find Liliana, Heretical Healer. A double-faced card enters the battlefield with its front face up by default. This is true whether it enters the battlefield after being cast or in any other way, such as being put onto the battlefield with a card like Rise from the Grave. (Can you imagine bringing Liliana back as a zombie? Oh, the story you'd have!) You can't cast the Planeswalker face of these cards. The legendary creatures all have an ability that exiles them and returns them to the battlefield transformed, meaning with its Planeswalker face (back face) up. 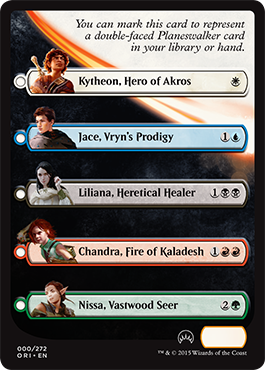 Like any Planeswalker entering the battlefield, they will do so with a number of loyalty counters shown in the lower right corner. Note that this way of "transforming" is a little different than what you may have seen previously with Innistrad block cards. You can activate one the Planeswalker's loyalty abilities during your main phase on the turn it enters the battlefield, just like normal. 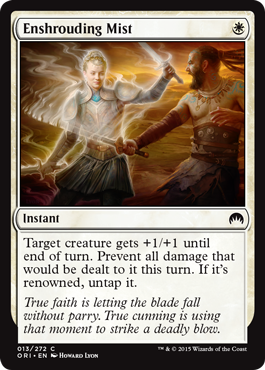 But be careful: If the Planeswalker enters the battlefield at a time other than your main phase (such as during combat), your opponent may have the chance to remove it before you can activate one of its abilities during your main phase. Although the two rules are similar, the "legend rule" and the "Planeswalker uniqueness rule" affect different kinds of permanents. You can control Liliana, Heretical Healer and Liliana, Defiant Necormancer at the same time. 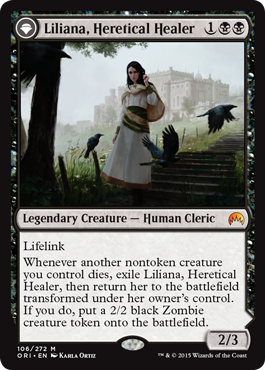 However, if Liliana, Heretical Healer is exiled and enters the battlefield transformed, you'll then control two Planeswalkers with the same subtype. One will be put into the graveyard. You have two options when putting a double-faced card in your deck: You can play with opaque card sleeves (you may already do this), or you can use a checklist card, shown below. Checklist cards can be found in some Magic Origins booster packs. Using opaque card sleeves is pretty straightforward. Put the card in the sleeve with the creature face showing, and take it out of the sleeve if it enters the battlefield transformed. You can leave the card out of the sleeve as long as the card doesn't go to your hand or your library. The important thing is that you and your opponents can't tell the difference between that card and other cards in your hand or library. To use the checklist card, you must have the actual double-faced card. Set your double-faced card aside and mark the checklist card next to the name of the card it's representing. Take care not to dimple the back of the checklist card. In tournaments, keep your double-faced cards separate from your sideboard so they can't be confused for sideboard cards. Only official checklist cards may be used to stand-in for double-faced cards in a deck. If you use a checklist card to represent any of the double-faced cards in your deck, you must use checklist cards to represent all of them. You'll use the checklist card any time it's important to keep the identity of your card secret–in other words, when it's in your library, in your hand, or exiled face down. You'll switch to the double-faced card when the card is on the stack, on the battlefield, in the graveyard, or exiled face-up. Any time a double-faced card is visible–whether because it's in a public zone, because it's revealed, or being looked at by a player–the players who can see it can see both faces. Any player who can look at a checklist card in a hidden zone may look at the double-faced card it represents. If you're drafting—and you really should be drafting—taking a double-faced card works a little differently than drafting any other card. Unlike other cards you draft, double-faced cards are visible to the other drafters. You can't try and hide it. You can put it on your pile of drafted cards front-face or back-face up. External whoops of delight are discouraged, but giggling to yourself internally is cool. If you're a creature of the Multiverse, dealing combat damage to an opponent is probably a big moment for you. 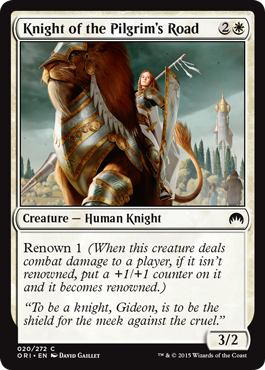 For a few creatures in Magic Origins, that moment is even bigger thanks to a new ability called renown. 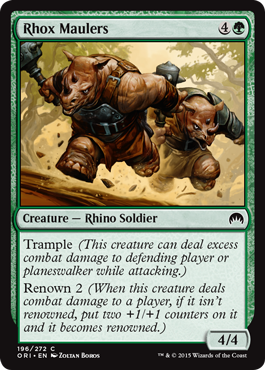 Renown triggers the first time a creature with renown deals combat damage to a player. The ability puts some number of +1/+1 counters on that creature (the number after the renown keyword). Also, it causes the creature to become renowned. So, if your Rhox Maulers deals combat damage to your opponent (and trample may help there), it will beef up to a mighty 6/6. Now that it's renowned, its renown ability will no longer trigger, but it will get a better effect from Enshrouding Mist. Renown won't trigger if the creature deals combat damage to a Planeswalker. In the unlikely event that the creature deals combat damage to its controller (through a damage redirection effect), renown will trigger. A creature that's renowned stays renowned until it leaves the battlefield, even if it somehow loses all its +1/+1 counters. 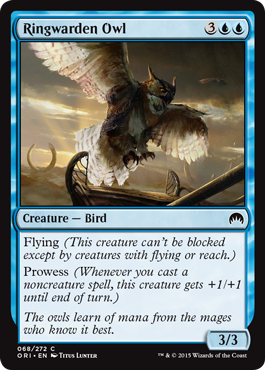 Some instants and sorceries in Magic Origins have spell mastery abilities. 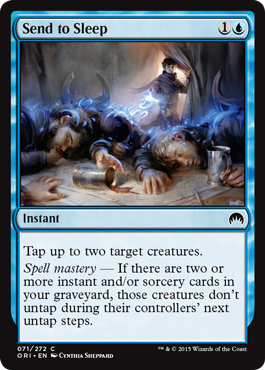 Spell mastery is an ability word, so it has no specific rules meaning, but it highlights cards that get better if there are two or more instant or sorcery cards in your graveyard. You count the number of instant and/or sorcery cards in your graveyard as a spell is resolving to determine if the spell mastery ability applies. Don't count the resolving spell itself. It's still on the stack at that point, not in your graveyard. Some spell mastery abilities add to the spell's normal effect. Check out Send to Sleep. Other spell mastery abilities replace part or all of the spell's normal effect. 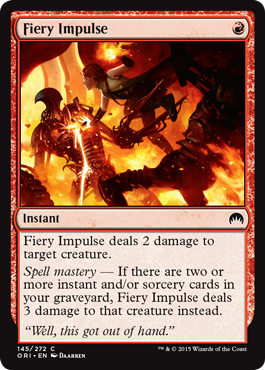 Check out Fiery Impulse. Read each card with a spell mastery ability carefully to find out exactly how it works. Menace is a new keyword for an old ability. A creature with menace can't be blocked except by two or more creatures. We ol' timers may know this as "the Goblin War Drums effect." 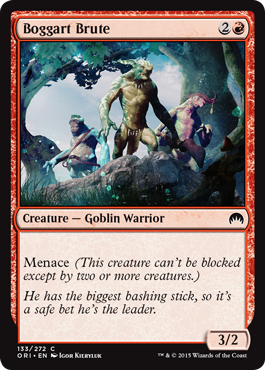 Once a creature with menace is legally blocked by two or more creatures, removing those blockers from combat won't change or undo the block. Some older cards with this ability will have their text changed so they now have menace. Remember long ago, when we had a block on the world of Tarkir? In an alternate timeline, it was ruled by five clans, each led by a fearsome khan. One of those clans, the Jeskai, had a signature ability called prowess. Well, we liked that ability so much that we decided not only to bring it into our timeline, but we're making it so it can appear in any Magic set, starting with Magic Origins! Prowess is a triggered ability that gives a creature +1/+1 until end of turn whenever you cast a noncreature spell. Creature spells won't cause prowess to trigger, even if those spells have other card types, such as an artifact creature spell. Instants work particularly well, as they become combat tricks that boost your attacking or blocking creatures in addition to whatever they normally do. When prowess triggers, it goes on the stack on top of the spell that caused it to trigger, meaning it will resolve before that spell. Once prowess has triggered, it doesn't matter what happens to the noncreature spell. If that spell gets countered, prowess will still give the bonus to the creature. 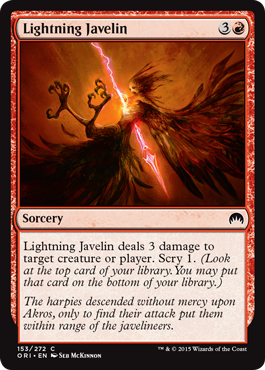 Scry is a keyword action that's appeared in several previous sets, and it becomes available for use in any Magic set as of Magic Origins. Scry lets you glimpse your future and possibly alter your fate. To scry N (where N is a number), look at that many cards from the top of your library. Then, put any number of them on the bottom of your library in any order and the rest on top of your library in any order. Pay close attention to cards that tell you to scry. Sometimes the card will have another effect that happens first. Other times you'll scry first. You always follow a card's instructions in order.